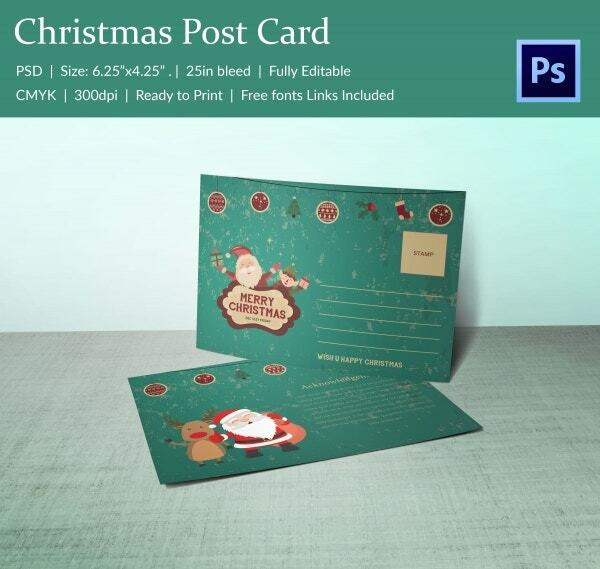 Christmas is almost incomplete without the holiday greeting postcards. 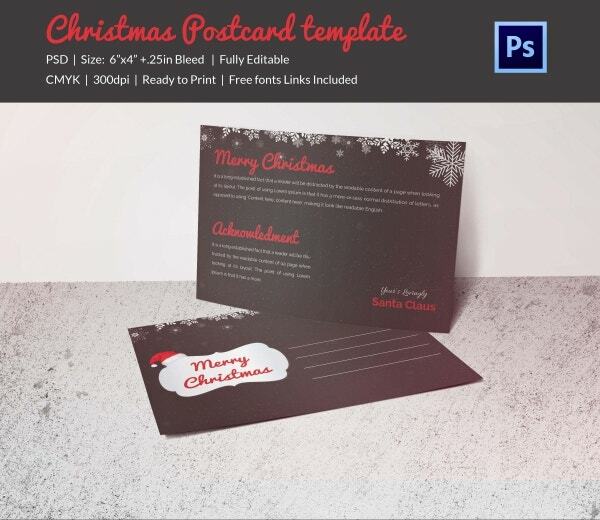 The Christmas postcards are not only cool for sending your best wishes for the holiday season but they also offer you a great canvas to detail about your special Christmas deals. 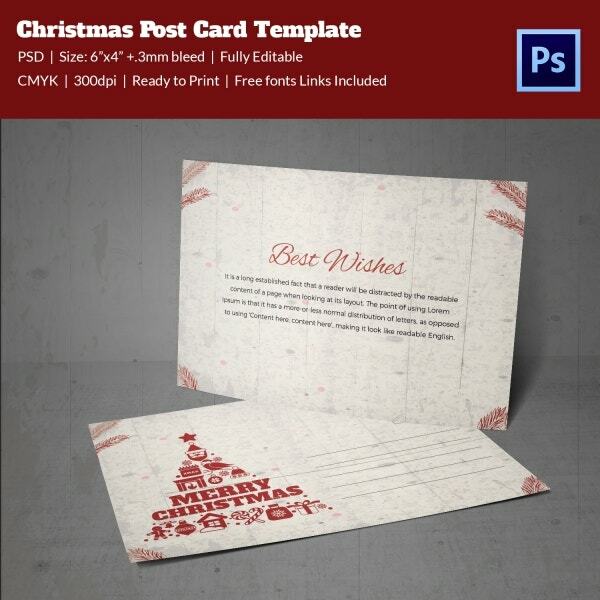 With the Christmas time knocking at the door, you must be looking forward to sending your own Christmas postcards. 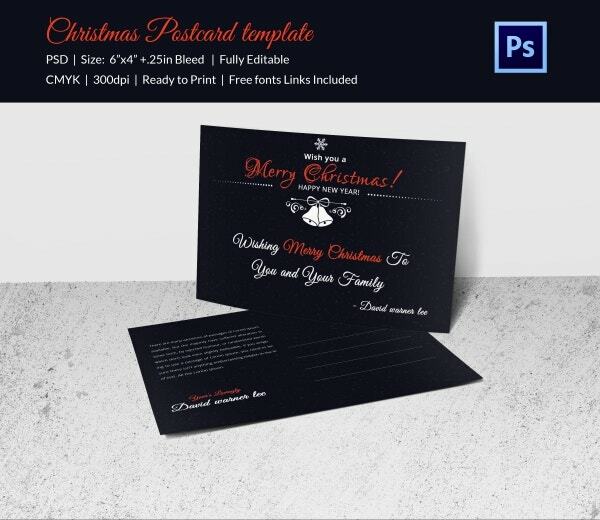 Well, you can save yourself a good deal of hard work now with the readymade Christmas postcard templates online. 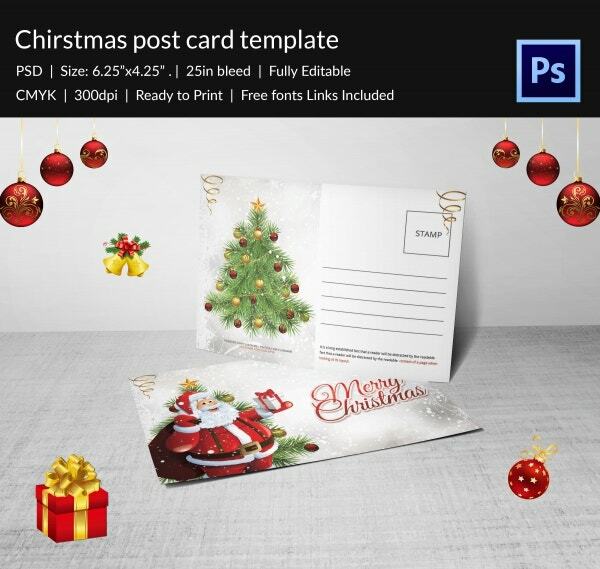 With the happy Santa smilingly handing you out a gala Christmas present flanked by the glittering Merry Christmas at his side, there cannot be a more joyous postcard for the upcoming holiday season. 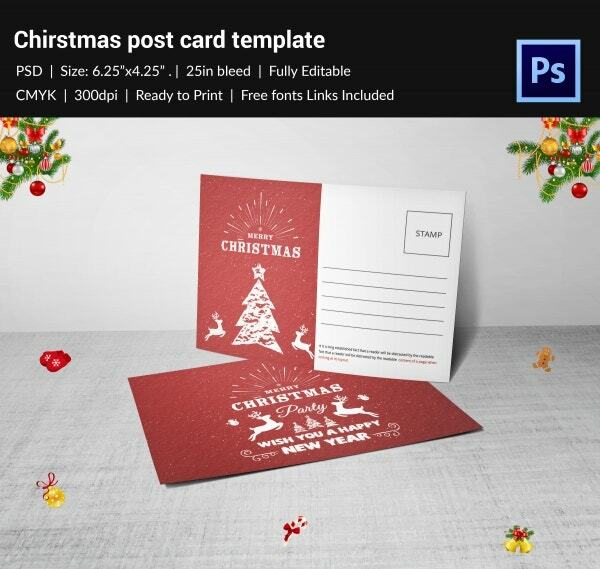 You have an elegant Christmas postcard here with the Christmas tree presented in a sleek brown silhouette – the reindeer and happy party message duly add spice to the merry spirit. 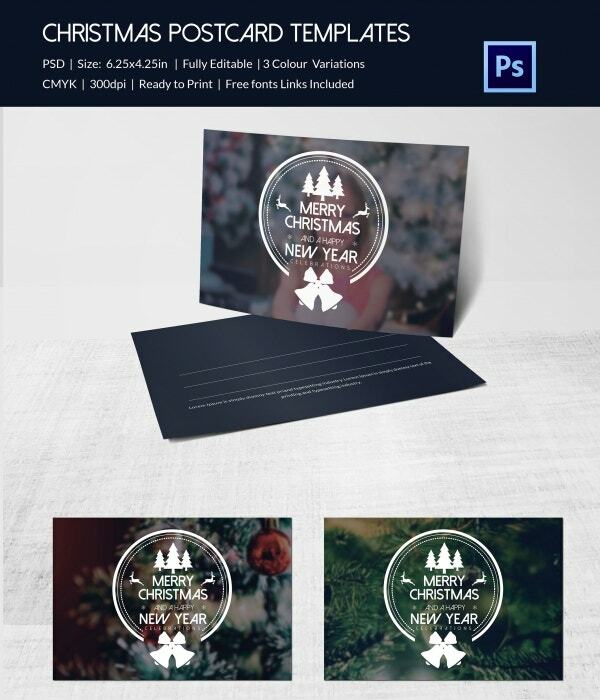 You can add your gala Christmas menu at the back. You have a sweet and adorable Christmas postcard here where you can post your acknowledgment with a happy snowman by your side. The backside is in perfect tune with the holiday spirit with all the signature props. The green backdrop duly reminds of the iconic Christmas tree; the merry Santa with his bag full of presents and a smiling reindeer complete the whole holiday picture with élan. 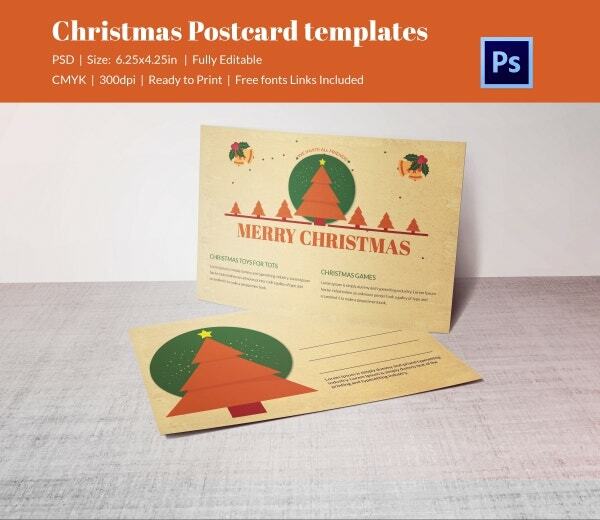 If you are planning for a Christmas party with great toys and games, this beautiful postcard would be an amazing Christmas invitation for you with its brightly decorated Christmas tree, snowy white backdrop and the colorful presents. 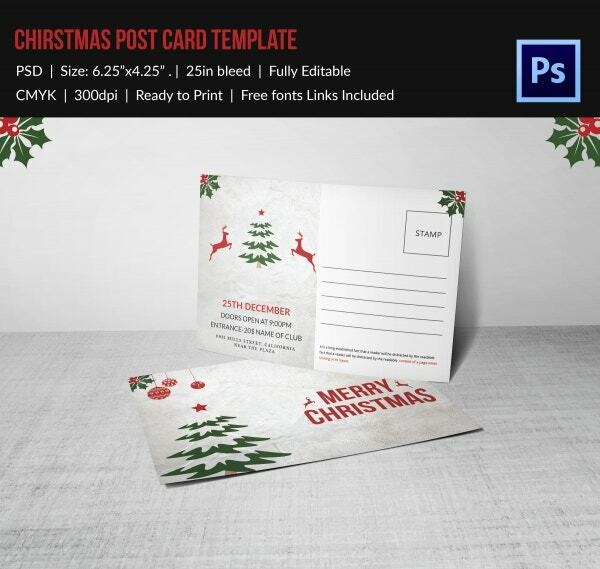 You have a simplistic Christmas postcard template here in 3 soothing colors that will serve as both Christmas and New Year greetings. The tree, reindeers and snowflakes at the backdrop set the mood perfectly. The snow laden Christmas tree looks just brilliant and the bright red balls create an amazing visual treat. It offers you enough space to add details about your Christmas party attractions. 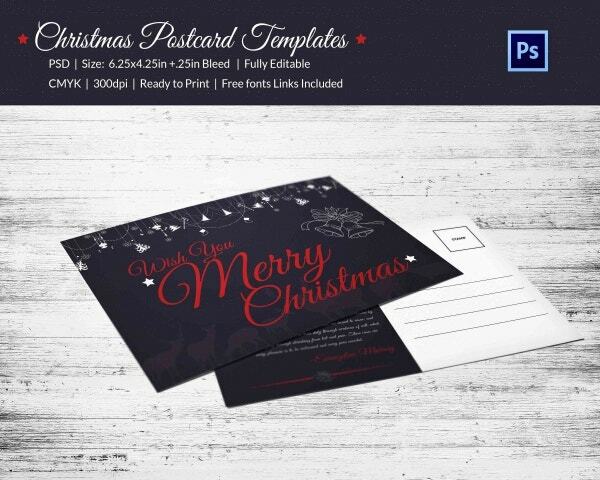 You have a gorgeous Christmas postcard template here -all thanks to the Christmas wreath created by the typical holiday season elements like reindeer, snowman, socks, Christmas presents and so on. 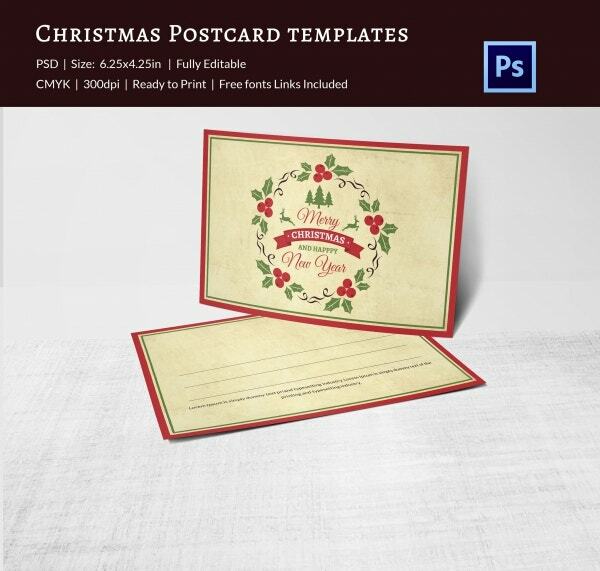 You have a lovely Christmas postcard template here in a soothing beige backdrop that has been beautifully embellished by happy greetings of the holiday season. It is accompanied by the Christmas tree, plums and reindeer. 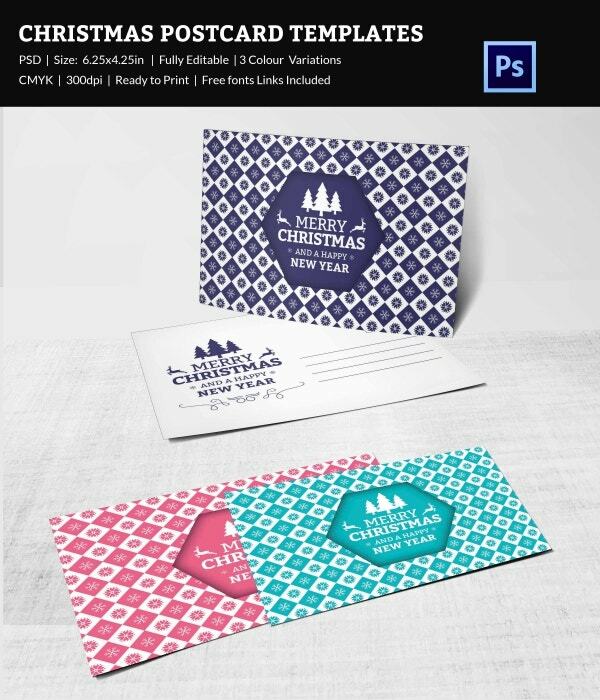 This bright vivacious lady Santa paints an amazing picture of the upcoming merry holiday season and you are getting a sizeable space here to highlight about your company and specialties here. 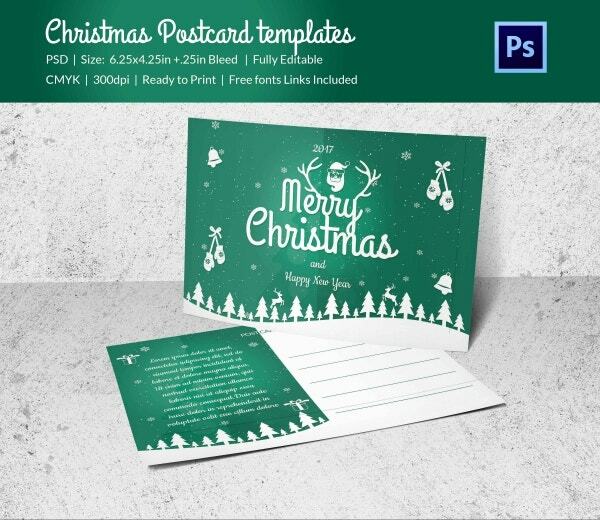 > How to use the Christmas Postcard Templates? 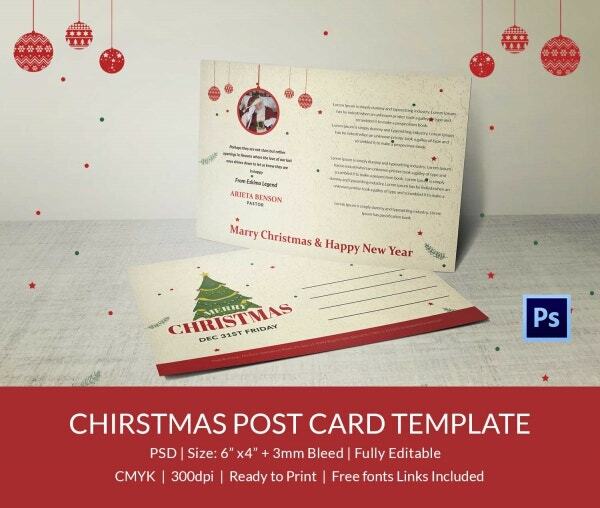 The Christmas postcard templates are simply awesome when you have to send your Christmas greetings and you are too packed to make one all by yourself. 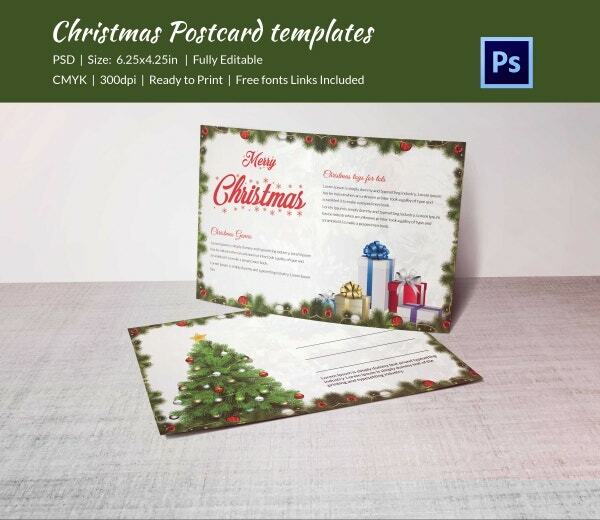 These templates would also be helpful when you have planned something special for Christmas celebration and now are looking to spread the word about it. 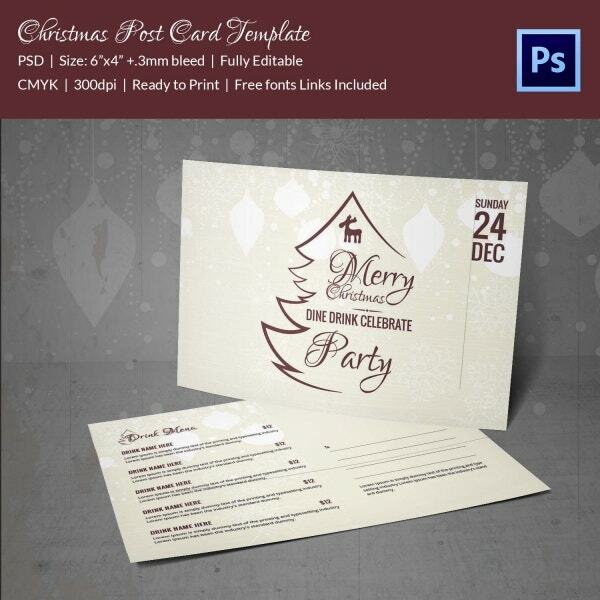 It could be a gala Christmas party or some mindblowing Christmas offers. 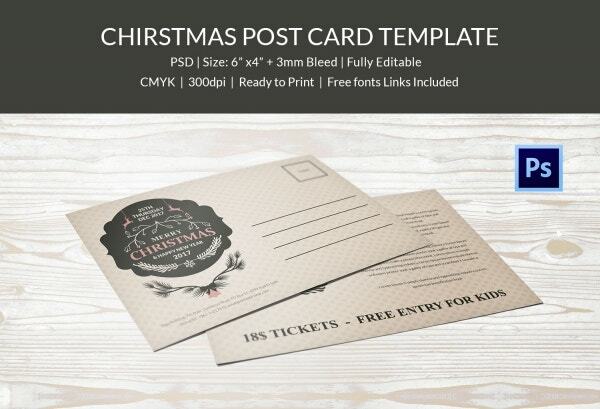 You can add details on the postcard template about the major highlights of your event and Christmas deal. 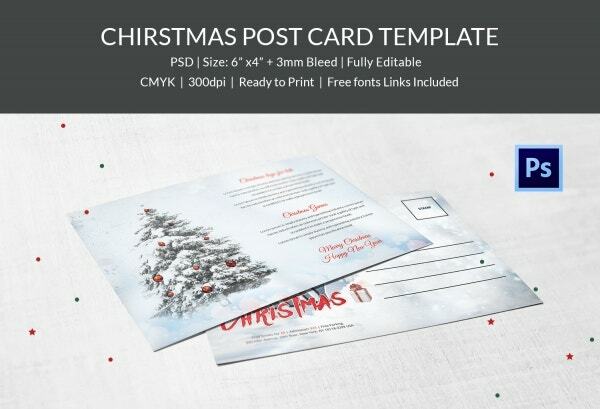 It’s a breeze to use the Christmas postcard templates. 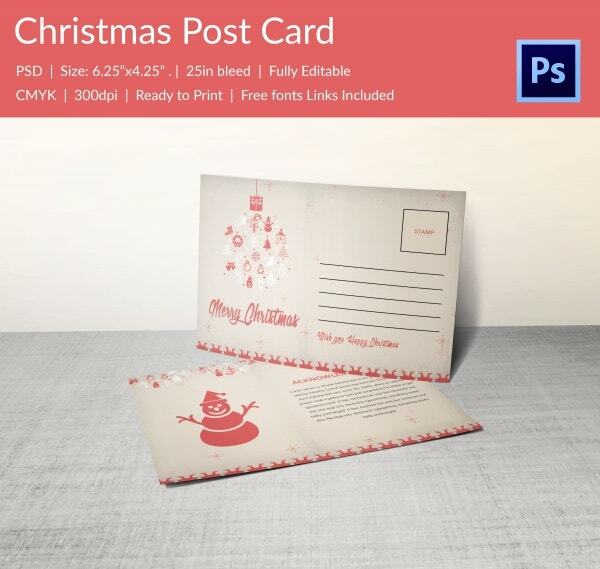 You would just have to download a postcard template, modify it according to your specifics and print it out. 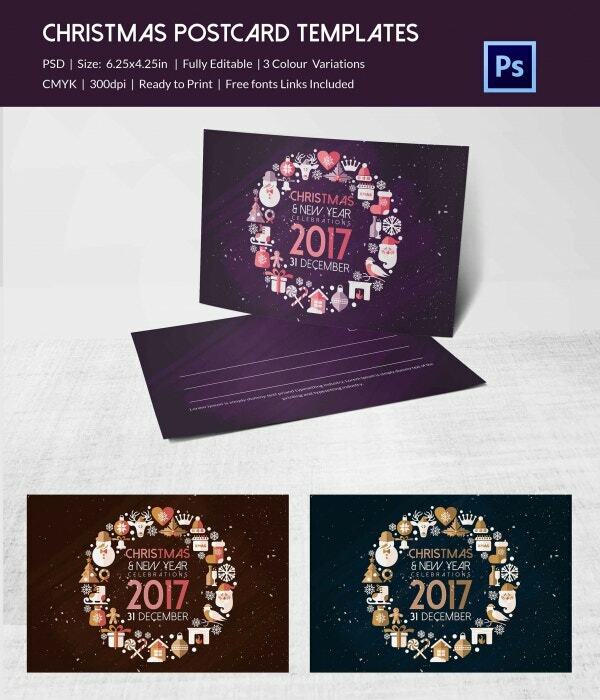 The Christmas postcard templates mentioned above enable you to choose from a wide range of variety as per your specific taste. 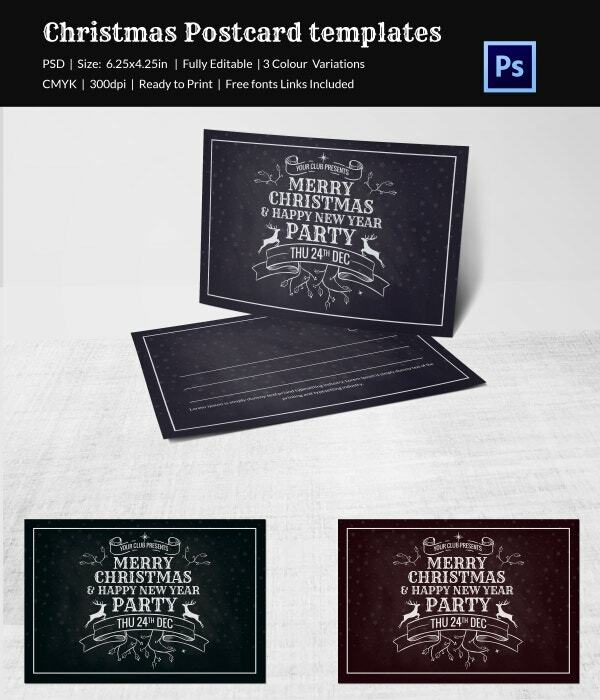 Whether you want something with the merry Santa at the front or a minimalist elegant one or a gorgeous one that speaks of a glittering Christmas party- everything is covered here.